Hog Raising is a great way to provide great-tasting meat for your freezer at a reasonable cost while utilizing a small amount of space. 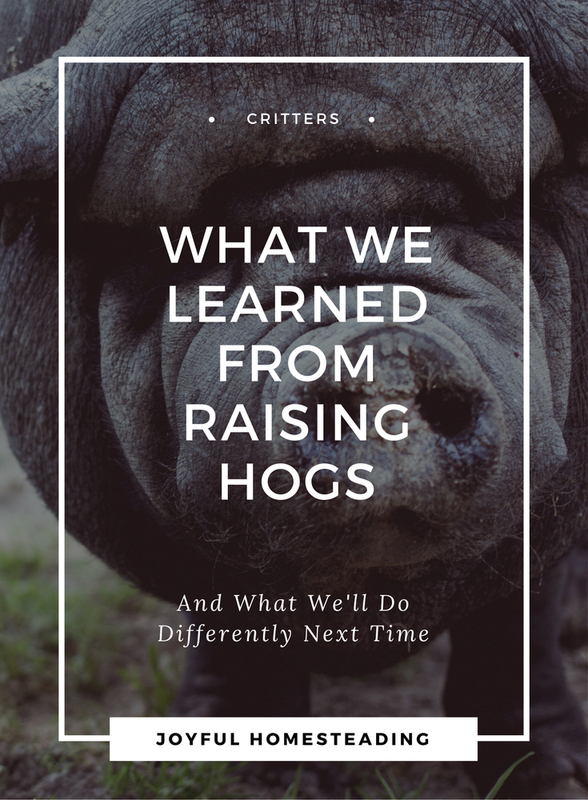 Overall, finishing hogs was a positive experience; and although there are definitely things we would do differently next time, raising hogs is an excellent part of a total self-sufficient lifestyle. 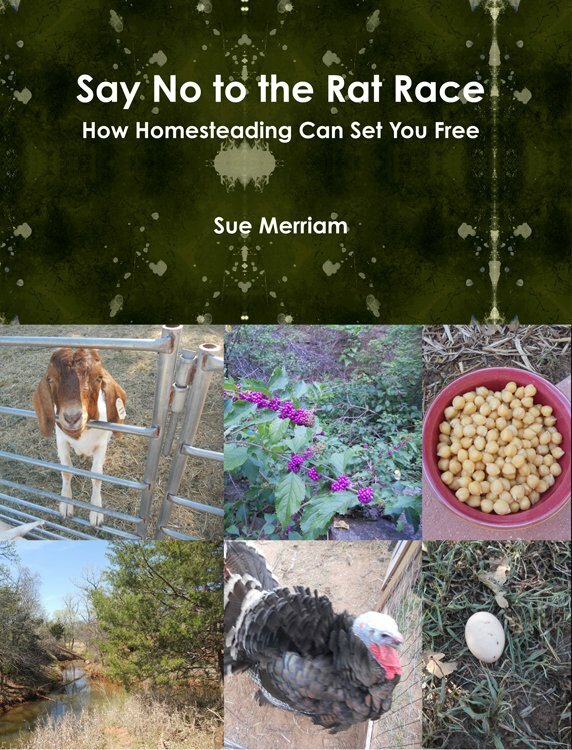 In addition to raising your own food through gardening, you can also raise good quality meat and even make a little money selling finished hogs. What I didn't realize with my first experience at hog raising is that processors have a busy schedule, and if you want a specialized service - such as having the processor come to your place to pick up your hog or two, or even better, have them butchered on your place, you will need to book a date months in advance. The next time we finish hogs, I plan to set a butchering date soon after we purchase our weanling pigs. With hog raising in areas that get truly hot in July (here in Oklahoma, it can get up to 100 degrees Fahrenheit or higher), you don't want to have a hog around. They'll be miserable - hogs don't tolerate the heat well - and they'll stink and attract flies which will make you miserable. If possible, get your weanling pigs as early in the spring as possible to reduce the odor. I've also heard of some people getting pigs in the fall and raising their hogs over the winter. I'd recommend it, if you can find them. I found this book to be invaluable. Not only does this reduce odor with hog raising, but your hogs will trample down the hay and stir it up, turning it into compost much faster. Add some cracked corn to give them sufficient motivation. It's their reward for doing the stirring for you. And as a result, this can be extremely useful with hog raising. Not only can you add it to your compost to get your hogs digging, you can also use it as a diversion tactic. Anytime I wanted to get the empty buckets out of the pen without hogs rubbing their dirty snouts against my pants, I would toss cracked corn over the side of the fence and then go retrieve the buckets. The hogs would ignore me while they devoured their favorite treat. My hogs weren't mean; they were friendly, sweet fellows, but even a gentle hog can do serious damage if he steps on your foot. Hogs can weigh over 200 pounds and don't care where they rest their hooves, so wear protective footwear. They love being sprayed with the hose, and they love to frolic. I now understand the meaning of the term "hog wild" and eating like a pig and even acting like a pig. Still, I wouldn't trade my hog raising experience for anything. Pork chops from a hog you raised yourself is a delicacy - so tender and succulent, it tastes like a good quality steak. For the taste alone, I definitely recommend hog raising. Farrow means to give birth. Barrow is a male that has been castrated. Gilt is a female under 18 months of age that has not given birth. Shoat is a recently weaned pig. Boar is an intact male. Sow is any female that has had a litter of pigs. Butcher or Market Hog is one weighing 220 to 260 pounds and ready for sale or butcher. They are between five and seven months of age. Feeder Pig generally weighs 40 to 70 pounds and is sold to be fed out to market weight. They are generally between 8 and 12 weeks of age. 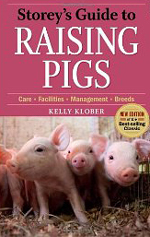 Finishing means raising or feeding a pig to market or butcher weight. If you have an acre or two and live out in the country, buying a couple of weanling pigs and finishing them - raising them to at least 200 pounds - then taking them to be butchered is a great way of filling your freezer with meat. Here is why raising pigs is a great part of self sufficiency.